Joyce has been married 13 years, with 6 children and 13 grandchildren. In addition, she is active in helping rescue animals the best she can. She also attends a local fitness center where she workouts to prepare her body for a double lung transplant. The weather and her failing health makes the training strenuous and complicated. But she pushes on. 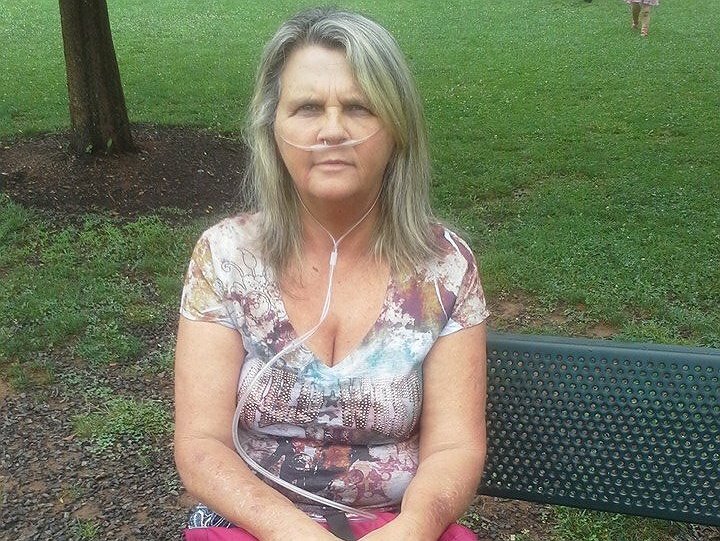 In 2005, at the age of 37, Joyce was diagnosed with COPD. Now at the age of 46, she struggles with this progressive disease daily. There is no cure. Before having to go on disability due to her illness, Joyce worked as a cashier – a job she enjoyed very much. With her friendly outgoing personality and ability to manage the many responsibilities of the job she was perfect for this type of work. Also, at one time Joyce loved being outside and enjoyed riding horses. In the 1990s, she worked with a local Horse Association to help raise money for a children’s hospital. However, Joyce can no longer do any of these things. Her life now is spent going to doctor appointments and adjusting to the many medications needed to keep her breathing. Currently, Joyce is a patient at Duke Medical Center in NC. Where she is monitored to know when the time will come that her lungs are no longer functioning and she will be placed on the transplant list. At this time she and her husband, Larry Baldwin Jr., must move closer to the transplant center in Durham, NC. Joyce does have insurance through medicare. Nevertheless, there are many fees the insurance does not cover. Larry Allen needs help with travel and lodging. As well as any deductibles and coinsurance payments concurred directly from the transplant. Therefore, we are asking for your help with prayers and monetary donations. Please help our effort by supporting Joyce through the Help HOPE Live Foundation. Helping to make this transplant possible and successful. The last ten years have been a constant battle for Joyce as she fights each day too breathe and survive. Your donations will help Joyce to continue on in her fight to live. Thank you with our sincerest gratitude and appreciation. I sure hope you get what you need, You are a sweet and kind person. Pray without ceasing! Jesus is in control!